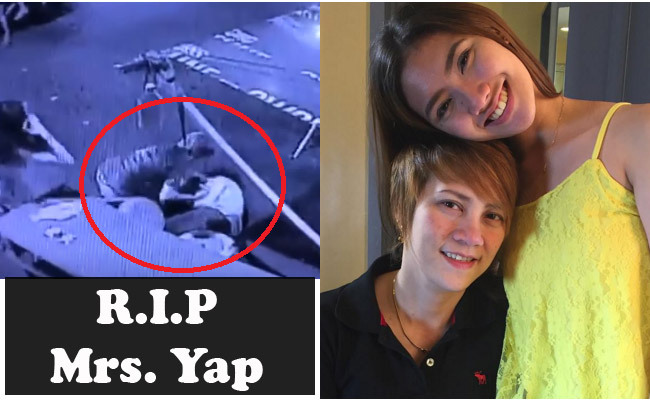 A CCTV footage caught how a gunman shot the mother of Angelica Yap, known to many as ‘Pastillas Girl.’ Teresa Yap was shot on Sunday night, November 29, at Tagaytay Street, Barangay 131, Caloocan City. Teresa Yap, or known to her family and friends as ‘Teteng,’ and a barangay kagawad, was about to eat in roadside eatery with her niece and a daughter when a man stealthily approached them from behind and shot her at a close range. The unknown man immediately fled as she collapsed in the pavement. Teresa Yap was immediately brought to the hospital by the her family and other citizens, yet she had sustained a fatal gunshot wound wand was pronounced dead in the hospital at 9:20 pm. According to Teteng’s relative, the victim had been receiving death threats through text messages. The messages reveal that someone threatens to kill the victim before Christmas. Teteng ignored the threats and shows not to do anything though she was troubled. The police are now investigating the incident and looking for information to know the motive behind the shooting. The CCTV footage was also able to catch the gunman’s escape in a motorcycle. The victim’s eldest daughter, Angelica Yap, became populat as ‘Pastillas Girl’ after she made a viral video on making pastillas and relating the steps with her former boyfriend. ABS-CBN had then featured her story in its noontime variety show ‘It’s Showtime’ and featured a dating game to help her find a new boyfriend. Some netizen had started bashing her, which prompted her mother ‘Teresita’ to speak up and defend her daughter. The show had sparked controversies which made a woman’s group voice out their concerns and complain. Pastillas Girl had not yet released a statement regarding her mother’s death and asked for her family’s privacy.